Over the years that I have worked in HR, I’ve taken a number of courses, read a number of books, and have seen and utilised a number of tools that have all promised success in leading teams and managing successful businesses. As helpful as they were, I found that the greatest asset in leading teams is not found in technical tools and procedures but in skilfully relating to people. You can have all the processes and procedures memorised, have all the certifications, be an expert in all the technical tools, and list out all the terminology without skipping a beat. But if you can’t skilfully manage human relationships and interactions, you will fail in your attempt to successfully lead teams and manage a successful business. 1. Don’t criticize or complain about people. 2. Praise improvement, even minor improvements. Psychologists discovered long ago that when you positively reinforce a desired behaviour, people are far more likely to repeat that behaviour. Most people want to do the right thing, which means you will find far more success in leading a team if you focus on using positive reinforcement rather than negative actions like threats and fear tactics. 3. Give honest and sincere praise and appreciation. All people deeply desire significance. One of the easiest ways you can help fulfil desire that is by offering honest and sincere praise and appreciation whenever possible. This is probably one of the greatest motivational methods you can ever employ. 4. Encourage other people to talk and be a good active listener. People want to be heard, really heard, and not patronised. Often, instead of listening to someone in a conversation, people are really just waiting for an opportunity to speak. If this is an area where you struggle, one trick is to say “What I understand you’re saying is…” By repeating what you understand the other person to be saying, it forces you to really listen to what they are saying. And as a side benefit, it reinforces to the speaker that you truly are listening to them and respect what they have to say. 5. Be genuinely interested in other people and make them feel important. Everyone’s favourite primary subject is themselves, it’s human nature. Social media at large and the “selfie” testify to this fact. Nobody likes to feel ignored and unappreciated, including you (see item 3). So go ahead and make an effort to be interested in people and you will win their gratitude and by extension a co-operative attitude. 6. Be sensitive to people’s pride and let them save face. The simple fact is that all people are prideful creatures. If you call them out on being wrong about something and make them look bad in front of others, they’ll fight you to the bitter end. But if you can offer criticism or disagreement in a manner that allows them to save face, they’ll be much more willing to cooperate and work with you. 7. Be respectful of other people’s ideas and opinions. Try to see things from their point of view. When you try to understand another person’s point of view you may find that you learn something. But even if you don’t, you will still find it much easier to respect the people with whom you disagree. 8. If you are wrong, be honest and humble enough to admit it. Sit down for a moment, are you ready for this? You are not perfect, you are not always right; you can and do make mistakes. One of the greatest personality traits you can develop is that of humility. We all make mistakes, and rather than deny and repeat those mistakes, wise people admit their failures and learn from experience. In doing this the wise person is able to grow and continually get better. If you’re honest and humble enough to own up to your mistake, apologise to those affected, and work to avoid repeating your mistake; you will gain the respect of those you work with. 9. Set a high bar for people and let them know you believe in their ability to succeed. In 1980, the US Olympic Men’s Hockey Team was set to play against the Soviet Men’s Team in the Winter Olympics. At the time the Soviet team was the undisputed powerhouse in men’s hockey. Nobody expected the US team to have any chance of beating the Soviet Team. The US team was a mix of amateur and collegiate players and the Soviet Team had won the gold medal in six of the seven previous Olympic Games. Before the game, the US team coach Herb Brooks read his players a statement he had written out on a piece of paper, telling them that “You were born to be a player. You were meant to be here. This moment is yours.”(Coffey, 2005). The US team went on to beat the Soviet Team and then Finland and secure the Olympic Gold. Set a high bar for your people, believe in them, communicate that to them and be amazed at what they can achieve. 10. Follow the greatest leadership rule ever given. If you wish to be a great leader, make it your focus to serve those whom you would lead. There are a lot of people that want the power, prestige and pay that comes along with leadership positions, but few want to do what it takes to actually be a good and effective leader. Great leadership isn’t about bossing people around; it’s about inspiring and guiding people towards a common goal for everyone’s benefit. Build your team up, give them credit for their work, praise their efforts and reward them when they succeed. 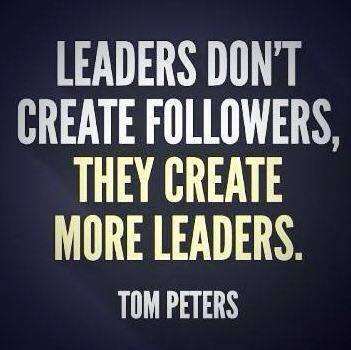 Be the leader that you would want to lead you. If are interested in becoming a better leader to your team and want to attend one of our programmes then please give us a call to discuss your options. We’re a friendly bunch and really keen to make a difference to your business by finding a solution that works for you and your business so call us on 01473 360160.